On May 19, 2015, BCJN members Carolyn Eubanks and Jennifer Scarlott, of the Food Justice Working Group, joined scores of activists on an early morning bus from Manhattan to Albany to participate in the day-long “Farmworker Albany Day,” lobbying for farm labor justice with workers and their allies under the banner of the Rural and Migrant Ministry (RMM). RMM is led by BCJN friend and ally Reverend Richard Witt, now in his 25th year of tireless struggle on behalf of the disenfranchised, disempowered, and nearly invisible NY State farmworker. In December 2015, BCJN’s Food Justice Working Group began planning for major BCJN support for the March for Farmworker Justice being organized by Rural & Migrant Ministry for May 2016. 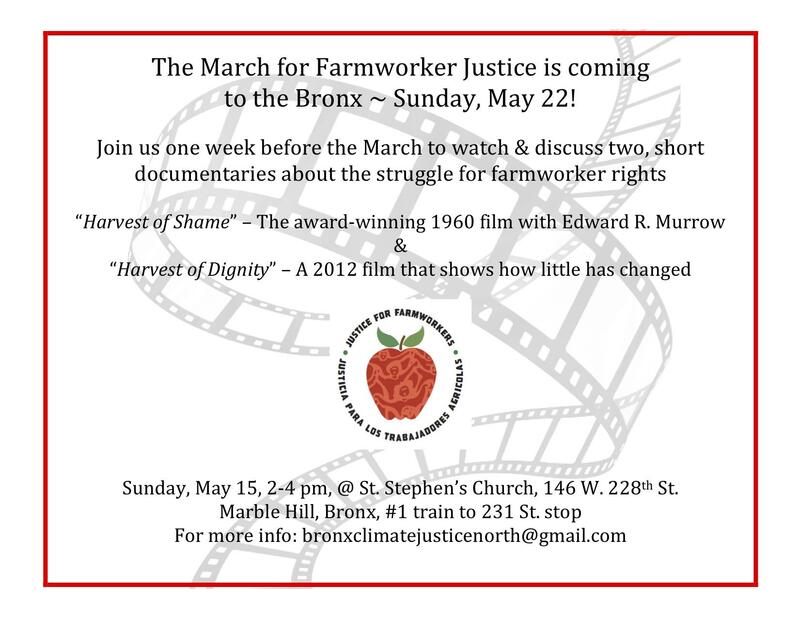 Our work on behalf of the March had 3 elements (see flyers below): a major forum at Christ Church Riverdale on April 17, 2016, a film screening of two farmworker rights documentaries (“Harvest of Shame”-1960 and “Harvest of Dignity”-2012) on May 15, 2016 at St. Stephen’s United Methodist Church in Marble Hill, and finally a rally and lunch in support of the March itself as it moved from Washington Heights through the NW Bronx on Sunday, May 22. BCJN served as a “Day Captain” for the evening of May 21 and the first half of the day on May 22, hosting marchers in our homes on the night of the 21st, and providing 200 bag lunches and other support at St. Stephen’s on May 22. On June 1, 2016, on the final day of the March in Albany, BCJN members marched and rallied with supporters and all those who had walked the 200 miles from Smithtown, before lobbying five State Senators on behalf of S. 1291, the Farmworker Fair Labor Practices Act. Tragically, the Senate once again failed to vote on the FFLPA. 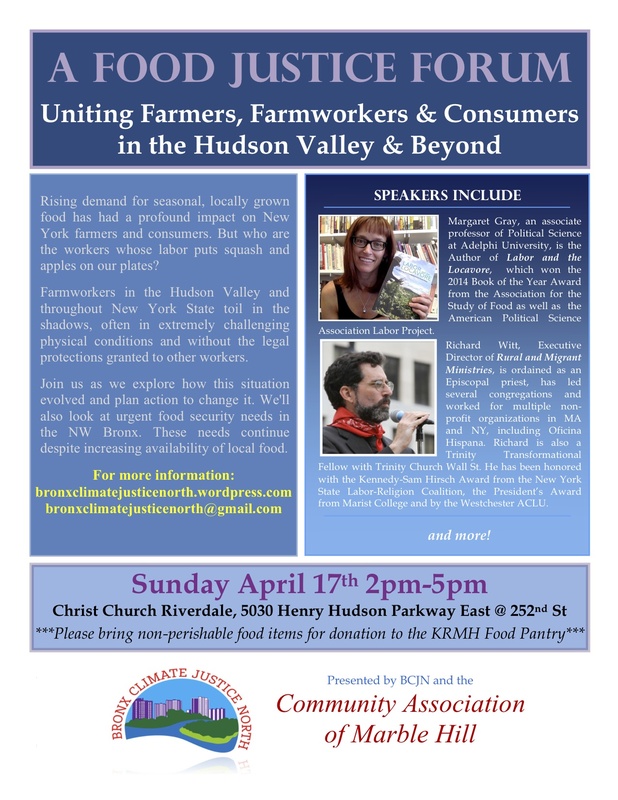 BCJN is joining with organizations and individuals across the length and breadth of NY State to fight for passage of the FFLPA until the struggle is won. In all of this work for the March, BCJN worked closely with the following allies and partners in the NW Bronx: Christ Church Riverdale Earth Ministry, the Community Association of Marble Hill, Riverdale-Yonkers Society for Ethical Culture, Congregation Tehillah, and St. Stephen’s United Methodist Church of Marble Hill. We also collaborated with R&MM board members Celia Baldwin and Maria Guarracino. We wish to give a special mention to BCJN member and Community Assn. 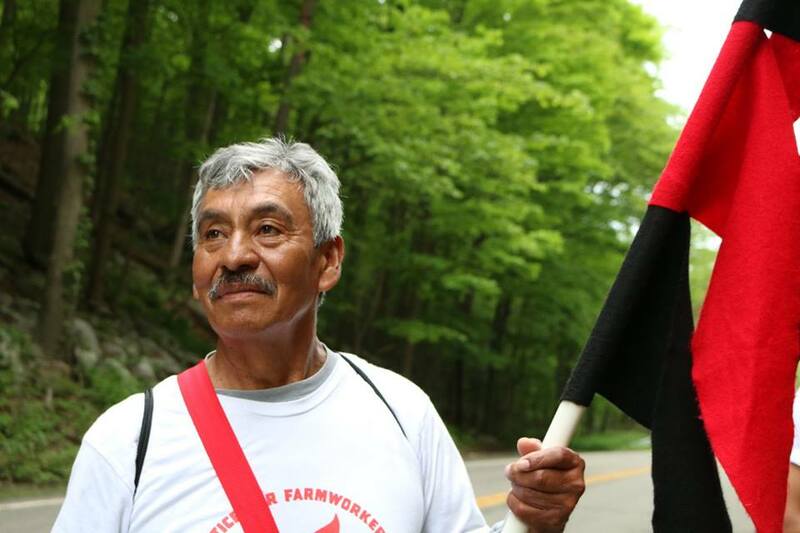 of Marble Hill (CAMH) activist Anthony Del Orbe, who walked every mile of the March for Farmworker Justice. Thank you for your leadership, Anthony. Great thanks, too, to your CAMH colleagues (and BCJN members) Ruby Palma and Hasan Covington, who served as drivers for the March vehicles. “My heart is at war with my feet” — a BCJN post for the Rural & Migrant Ministry blog Witness about the March for Farmworker Justice, 5/26/16.